There are two forms of English in Singapore, there is standard Singapore English and Singapore colloquial English also called Singlish. 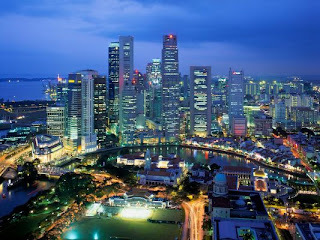 In Singapore there live people from all over the world, therefore the language is affected by accents from all over. An example is that about one third of the Singaporean Chinese population in Singapore speaks English as mother tongue, but nearly fifty present speaks Mandarin. Therefore the English in Singapore is affected by different languages, and the accent varies from person to person. Singapore was a British colony from 1819 to 1965, therefore the standard form of English in Singapore is British. The grammar and spelling is almost the same in Singapore as in England. It is the most well educated Singaporeans who speak the standard form of English. The other form of English in Singapore is Singlish, it is seen as low prestige to speak Singlish in Singapore. The language is influenced by Mandarin, Malay and Hokkien. Therefore they speak English, however they have putted in some non-English words instead of speaking fluent British English. Interesting post about speaking English in Singapore. Sounds complicated! It is easy to understand how being a British colony influenced the language.